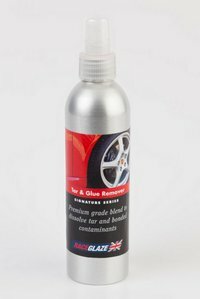 Unlike other tar removal products on the market this is so powerful that we've had to bottle it in aluminium to keep the animal that it is inside ! So it works quickly and economically - the last thing you need is to be on your hands and knees for ages scrubbing away at low down tar spots. Its perfect too for dissolving glue residues from old stickers and decals. It should take only 2-5 minutes to work - simply spray on a fine mist and wipe off with a soft cotton or microfibre cloth.